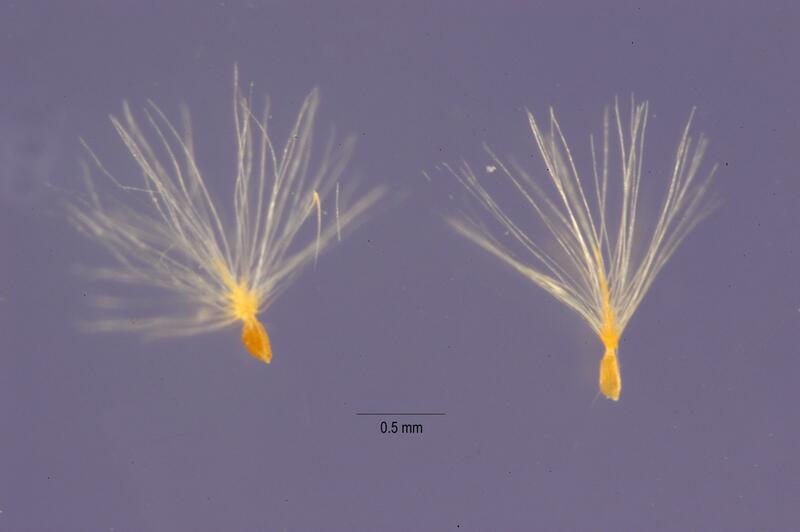 Each tamarisk plant can produce hundreds of thousands of seeds, like these ones from Tamarix pentandra. Their enemy was the tamarisk, a small tree with a prehistoric look to it -- tall, with scaly leaves and tiny pink flowers. It looks delicate, but the kind of delicate that makes it indestructible, like if it got stepped on by a dinosaur, it might bounce right back up. 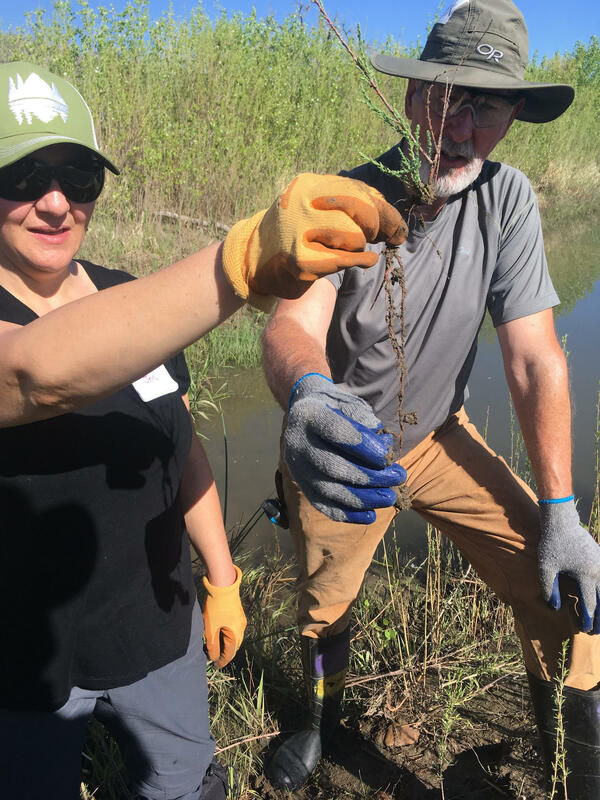 Jennifer Stevens and Mark Hinchman with Wildlands Restoration Volunteers display a freshly pulled tamarisk seedling at a weeding event in Longmont, Colo.
“This is a war,” says Matt Chew, a historian of invasion biology at Arizona State University. But he thinks this war is aimed at the wrong enemy. “There's been a concerted effort to demonize tamarisk,” says Chew. But he says the plant is a scapegoat for our struggle with something much bigger and messier than weed-infested fields: our relationship with water in the West. Tamarisk plants, like this one in Albuquerque, New Mexico, are adapted to tough conditions. They can survive easily on salty water, exuding extra salt through their scaly leaves. The tamarisk has a reputation for hogging water. Back then, Chew says, a company called Phelps Dodge wanted to expand its copper mine in Arizona, but it didn’t have the water rights it needed for the additional mining and processing. All the water rights to the nearby creek and river had already been allocated. Chew says they inspected the nearby water sources and found lots of tamarisk growing along the edges. 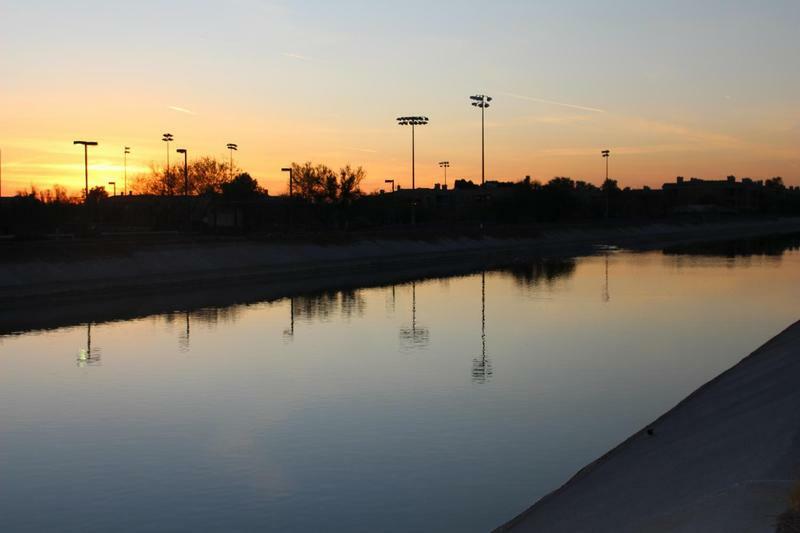 He says mine officials rationalized that if they could prove the tamarisk was draining river water, then the mine could potentially get the rights to the “extra” water that could be freed by killing tamarisk. “Phelps Dodge did a bunch of experiments which were later picked up by the Agriculture Department,” says Chew. Though the mine ended up getting its water rights through other means, that didn’t matter for the tamarisk. Its image was already destroyed. Since then, researchers have shown that the plant doesn’t use more water than native river vegetation, including cottonwoods. To make matters worse, something big was changing around that time: the way that water was being moved through the West. 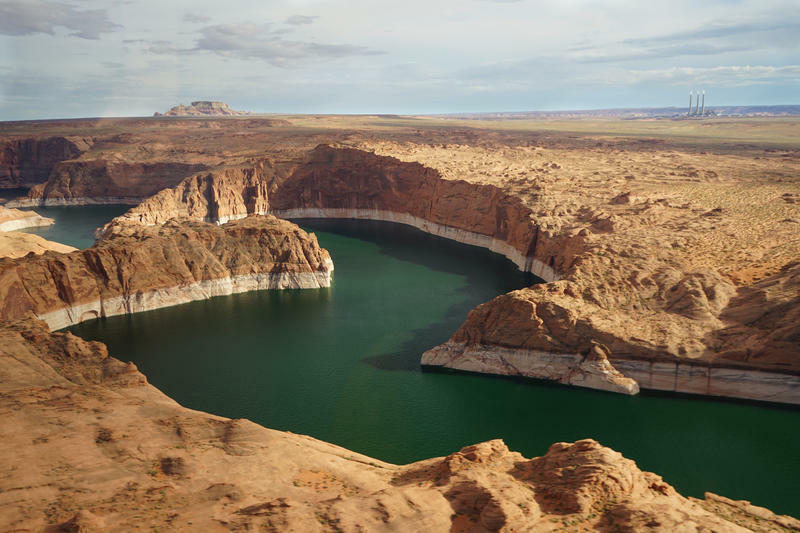 Dams and diversions were changing the patterns of flooding, patterns that used to be in sync with the reproductive cycle of more sensitive native plants like cottonwood trees. “To some extent, the way we were managing western rivers actually created a giant tamarisk housing project,” says Chew. If tamarisk is a monster, he says, it’s because we created it. Volunteers with Wildlands Restoration Volunteers canoed to a small island in a pond in Longmont, Colo., to cut down tamarisk and spray the remaining stubs with an herbicide. “If you want good, old-fashioned 17th century riparian areas in the western U.S., you can't take all the water out of the river. You can't have big irrigated fields. You can't have huge cities,” he says. 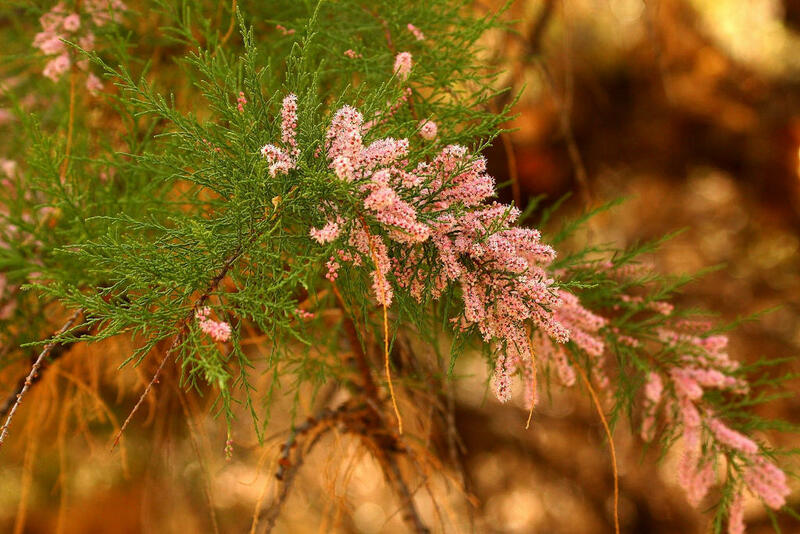 Anna Sher, an invasive species biologist at the University of Denver and author of the book “Tamarix: A Case Study of Ecological Change in the American West,” agrees with Chew that the tamarisk is not all bad. Yes, Tamarix (the species’ genus) can create saltier surface soil and fuel more intense fires with its dense wood. Sher even heard that a boater drowned in Arizona because rescuers couldn’t get through the dense thickets of tamarisk crowding the shore in time to help him. It provides nesting spots for a bird called the Southwestern willow flycatcher, for example, and she says it’s entirely possible for the trees to be a part of the landscape without completely taking over. “It's only behaving badly because of the way that we've managed our rivers,” says Sher. The way we manage our rivers isn’t going to change anytime soon, but Sher says there is hope for restoring the landscape. It’s called the Field of Dreams hypothesis. “The Field of Dreams hypothesis predicts that when you remove the invasive species, there's an opportunity for the desirable species to come in,” she says. Ecologists including Sher suspected the hypothesis itself was just a pipe dream. There are two conditions required for such restoration to be deemed successful. First, there has to be enough water in the rivers and streams to supply those new plants. Secondly, she explains, you have to stay zen about what native plants might come back. They might not be the cottonwoods and willows people always hope for. “It's a new game now with Tamarix here and with the water needs that we have now,” Sher says, and we’ll have to get used to plants that can handle the landscape as we’ve shaped it.